Lakeview College of Nursing is accredited by The Higher Learning Commission (www.hlcommission.org), a regional accreditation agency recognized by the U.S. Department of Education. The Higher Learning Commission (HLC) accredits U.S. colleges and universities at the institutional level. Accreditation provides assurance to the public and to prospective students that standards of quality have been met. 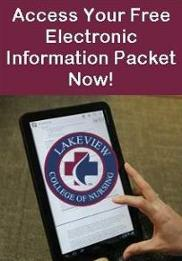 The baccalaureate degree in nursing at Lakeview College of Nursing is accredited by the Commission on Collegiate Nursing Education. (CCNE, 655 K Street, NW, Suite 750, Washington, DC 20036, 202.887.6791). Lakeview College of Nursing is authorized to operate and grant degrees by the Illinois Board of Higher Education, 1 N. Old State Capitol Plaza, Suite 333, Springfield, IL 62701-1377, 217.782.2551. To report unresolved complaints to the Illinois Board of Higher Education, visit their webpage at http://complaints.ibhe.org/. Lakeview is currently on probation for a first-time NCLEX-RN pass rate below 75%, but has received continued program approval in May 2018 from the Illinois Department of Financial and Professional Regulation's Board of Nursing, James R. Thompson Center, 100 West Randolph Street, Suite 9-300, Chicago, IL 60601, 312.814.2715.